When I started Retro Fridays, I knew at one point I would have to do an Ellen Emerson White book. I realize I've gone on about my love for her novels at length on the blog. This is not breaking news. But that's sort of the point. I also realized I've only actually reviewed her most recent book--Long May She Reign--the fourth in her President's Daughter series. And that's a wonderful book, and it is an excellent series, but to really get to the root of my EEW love we're gonna need to go back to the beginning. I must have been fourteen. 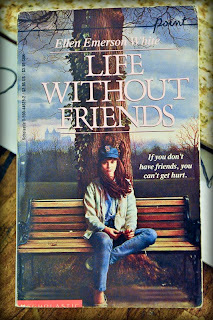 I saw Life Without Friends sitting faced out on the bookstore shelf and thank goodness for whichever prescient bookseller it was that faced it out because it was the cover that sold me. I would never have picked it up if all I'd seen was the spine. The title is, as my husband would (and has!) said, possibly the most depressing book title of all time. But the cover. I love it. Because the girl doesn't look depressed. Thoughtful? Yes. Lonely? Most definitely. But something in her face told me she was tough. Then there's the park bench, the leaf in her hand, the ivy-covered tree, the Boston Red Sox cap awkwardly perched on her head, and the city skyline in the distance. SOLD. He walked over to the cast-iron fence, leaning against it, staring out at the street. "Can't figure what you want me to do." "Who says I want you to do anything?" "Well, I dunno," he said, turning around. "Seems like you keep getting mad." "Still can't figure what you want." He put his hands in his pockets, the cigarette hanging out of his mouth. "Like, if you weren't so totally weird, I'd ask you out." He frowned. "You'd prob'ly call the cops 'r something." Beverly looked at him slouching against the fence, hair tousled, cigarette hanging. "Is this your James Dean imitation?" "Give it more pain," he said, and slouched lower, demonstrating. He straightened. "So, do I ask you out, or what?" "Couldn't we just be--friends or something?" "Well, yeah. I, uh," she coughed, "don't have so many right now." "There something wrong with you?" She tightened her arms, hunching over them. "Sorry," he said. "That was mean." He took the cigarette out, studied it, then put it back in. "Actually," he exhaled, "I don't have so many myself." He shrugged. "Lots prob'ly. Anyway," he shifted his weight, "you don't seem like you'd be too bad of a friend." Beverly also shrugged, her fists nervously tight. "Might not be that great." "So, uh," he spoke first, "you doing anything tomorrow afternoon?" "No, I--" Dr. Samuels. She sighed. "Yeah. I have a doctor's appointment." He looked suspicious. "For real?" "Oh, yeah," she said. "This is starting off great." "Guess you really have a doctor's appointment." "Well. You busy this weekend?" "I don't think I can go out at night," she said uneasily. "You turn into a werewolf?" "We could do something during the day." The part of his mouth without a cigarette grinned. "Hear friends do that sometimes." "Can I call you? Like to--"
"No," she said quickly. "I mean--my father's strict." "Look, you want to meet here at one? On Saturday?" He looked around the graveyard. "Here?" "Okay." She took a first nervous puff of her cigarette. "Then, I'll--I'll see you then." "Okay," he said, giving her a James Dean grin. "See ya." I love, love, love Derek. I'm going to remember this author's name now. Janice, I haven't really given you a choice, have I? :) I think you would like this one a lot. Also, THE ROAD HOME I think might be right up your alley. I love that excerpt! It's now reminding me of this book I read to pieces during my teenage years. But can I remember the title, author, or even the plot? No... it's driving me mad now. I've officially added EEW to my list of authors to try. Anon, comrade! I had to laugh at your mom's reaction. And I think I will be falling in love with Derek for the rest of my life. "Just that kind of guy." I *love* EEW. The President's Daughter was one book I read over and over as a teen, but I've never seent his one. Did any of you read Caroline B Cooney? She was a writer I adored as a teen who reminds me a lot of EEW in terms of writing style. She's probably most famous for THE FACE ON THE MILK CARTON but my fave by her was always 20 Pageants After, which is about the younger sister of a beauty queen. this sounds like a book I would enjoy! I love the tension and humor in that excerpt! I'm sold. I really need to read all of EEW's backlist one of these days - she writes such intelligent, honest characters that I can't help but love. I actually just finished the Echo Company series and I am still a little speechless. It was too amazing. I think I love Michael even more now. Diana, grin. You, my dear, simply must read this one. You know, in all that available time you're going to have once you whip KU2 into shape. ;) I did read Caroline B. Cooney as a teen but I've never heard of Twenty Pageants After. Thanks for the rec! Sharry, you hit on exactly what I love about EEW's writing. The mingled tension and humor. They're always there in spades. She's the master. I think you'd really like this one! Michelle, you're welcome. And you're right. Her characters get me every time. So smart, so honest. So much it hurts. In the best way. I am absolutely tickled you read the Echo Company books! Could you believe those last 2? I was in absolute heaven reading them. My love for Michael is a large, large love. I never read this one. I hope I can find it because I loved that excerpt. Have you ever read Julian F. Thompson? I was such a huge Grounding of Group 6 fan. I managed to keep my copy over the years. I haven't ever read any Thompson, though I totally remember running across The Grounding of Group 6. I'm thinking I need to read it. I love all these good, old recs I'm getting from the Retro Friday posts! I loved this book when I read it--once upon a time, of course. I think it was the first book I read that used "the F word." I'd forgotten most of the plot though--and I had no idea it was a sequel! Feeling a little obligated to go find both books and read them now. Jena, lol. I think it was the first one I read with the F word as well. Funny, that. If you do get around to re-reading it, let me know!